Actually, the still young tea cultivation region in north Thailand is mainly popular for its Oolong and green teas. Meanwhile, though, other tea processing variants have become common there, too. So, for example, our Jin Xuan Black Pearls, a black tea from north Thailand that is based on the Taiwanese Jin Xuan tea cultivar. Already soon after its introduction in 2010, this black tea from north Thailand has manage to conquer the hearts of tea lovers worldwide. In the nomenclature of this high-aromatic Thai tea novelty, “DMS” means the cultivation region, Doi Mae Salong. Then, “Jin Xuan” is the Taiwanese name of the relevant tea cultivar, while “Black” stands for black tea. And “Pearls” means the ball shape the tea leaves take on through rolling during processing. 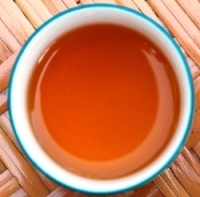 In the cup, the carefully handpicked and traditionally processed ‘Cha Deng’ (= Red Tea), as the producers call their black tea , shows a clear red color. And the fresh infusion’s fragrance, touting for our senses’ attention with nutty and fruity notes, already hints at this tea’s mild, but nevertheless rich taste. Then, this black tea from north Thailand shows the same tantalizing sweetness that we know from Taiwanese Jin Xuan “red” teas. Doi Mae Salong is the center of tea cultivation in north Thailand. Since the end of the 1980’s, there’s a number of Taiwan-imported tea varieties growing here, besides the native Assamica type tea tree. 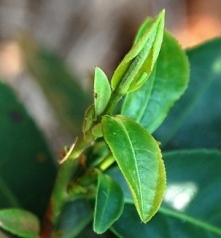 One of these tea cultivars is the “Jin Xuan” or “N° 12” cultivar. Meanwhile, the local community, consisting of ethnic Chinese settlers and several mountain tribes, has made tea the region’s major cash crop. This black tea from north Thailand achieves best taste results at a dosage of 3g on 200ml water. At this, select your infusion temperature at 90°C – 100°C. To fully assert the wealth of aromatic facets of DMS Jin Xuan Black Pearls, we recommend extended infusion periods of 3-5 minutes. This way, our black tea from north Thailand has the potential to produce two full value infusions.